The product portfolio is also supplemented by a CNC throughfeed drilling machine for vertical drilling from above and horizontal drilling from three sides. The N2508 is equipped with two gantries, each with two supports carry a total of four individually selectable drill units and a total of 84 vertical and 16 horizontal separately selectable drills. It is designed for high performance at batch size 1. 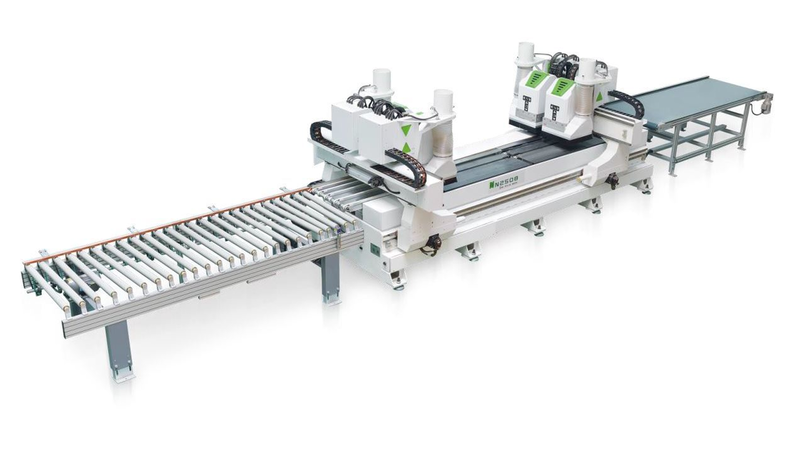 Either two plates or one long workpiece can be machined simultaneously with all four drill units. Thanks to the cross layout of the four drill units, a large number of drilling patterns can be reproduced efficiently. Each machining unit is driven by separate servo motors (16 in total). The roller conveyor for loading and the unloading table with conveyor belt allow the machine to be integrated into an automated production line.